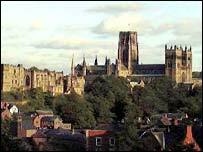 The growing number of students in Durham is causing a housing crisis for residents, according to the city's MP. Gerry Steinberg blames the shortage of affordable properties on Durham University failing to build any extra halls of residence for students. He said: "I have been in consultation with the university for 15 years about this problem. "When I first became an MP, 16 or 17 years ago, I think there were about 4-5,000 students in Durham. Now I think there are about 15-16,000 students. But Professor Tim Burt, the dean of colleges at the university, said the university was tackling the problem, and planned to meet the shortfall in student residences. He said: "We have a major plan in train that will provide an extra 1,000 beds both for undergraduate and graduate students. "We hope that will come online in 2005 and 2006." He denied the university had taken on more students than it could cope with. Mr Steinberg also claims landlords buying up houses for students are pricing first-time buyers out of the market, forcing local people to move out. He says many landlords are involved in "wholesale buying", with some owning vast numbers of properties. However, Keith Johnson, from JW Wood estate agents in the city said he only knew of one firm who was buying a significant number of properties. "Generally speaking, these properties that are let to students are owned by lots of individual landlords", he said. He said first-time buyers had not been in the city centre for 25 years because the houses were mostly terraced, without the gardens and garages required.